KAMPALA– The Uganda Communication Commission (UCC) awarded over 30 students on Tuesday evening. The awarding of the students followed their remarkable performance in the Information and Communications Technology, environment and safe Internet use essay writing competitions. Speaking at the competition climax event held at UCC’s headquarters in Bugolobi, the commission executive director, Godfrey Mutabazi said the initiative geared towards involving young people in assessing the current situation in the ICT sector. “At UCC, we are providing an opportunity for you the young people to determine the future of the communications sector and the country,” Mr Mutabaazi said. The competition was organised by UCC as part of the commemorative activities to celebrate the 20 years of regulation of the communications sector in Uganda. Winners from the competition received certificates and awards among other prizes. UCC also promised to pay their school fees for a full year. The commission also donated desktop computers to each of the ICT teachers that participated in the mentoring the students and pupils for the competition. “We received over 325 essays countrywide even from districts as far as Koboko, Kabale, Kapchorwa, and Moroto. The interest and enthusiasm expressed by the writers were amazing,” Mutabaazi said. Students also debated whether the Internet should be regulated in schools as they presented various views on how controversial and the sensitive matter should be handled. The discussion on the regulation of the Internet is currently taking centre stage at all levels including the international stage. Mutabazi said that views and opinions expressed during the debate; especially whether the Internet should be regulated, by who and to what extent have opened commission’s eyes to the realities on the grounds and that they will be documented and presented to various stakeholders for consideration. 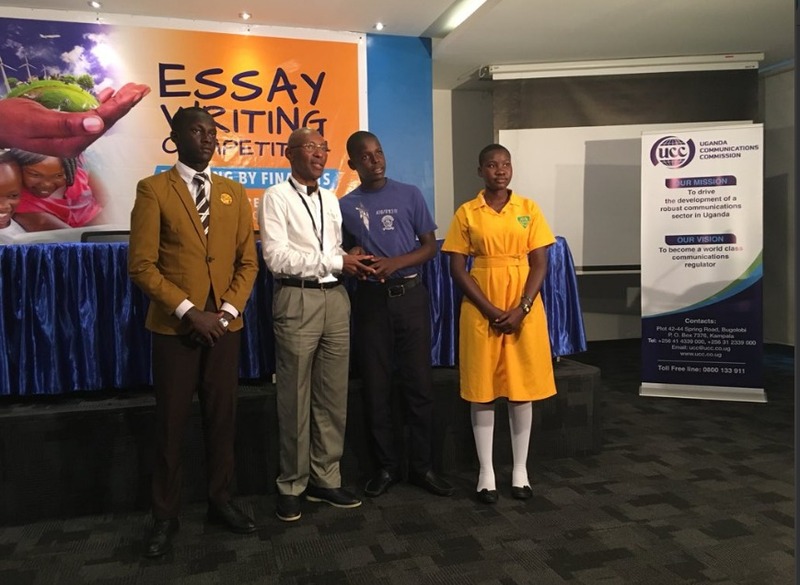 “The essays contained very brilliant ideas from the students, we believed if, harnessed—point to a bright future,” he said revealing that UCC contracted an independent team of evaluators to select the regional and national winners. Fred Otunu, UCC’s cooperate affairs manager commended Mutabaazi for involving young people into the state affairs especially ICT. He said that Mutabaazi has done well especially on sponsoring all activities aimed at empowering youth and children as the commission strive to make them embrace ICTs. UCC also recently ran the ACIA Awards, an initiative aimed at promoting awareness of the potential of ICTs in transforming the Ugandan economy, as well as encouraging innovation of local solutions to local challenges. The Awards then comprised many challenges including Uganda’s ICT Rising Stars challenge targeting secondary schools. UCC has also set up school ICT laboratories in over 1000 schools and the school ICT clubs that the commission is continuously championing in various schools.